I've never grown cabbage before last year, and never really got the hang of container gardening to begin with, and I think I probably overcrowded my cabbage, since it never formed heads and just sat around getting leggy. I brought it inside last fall, because it was still alive and some of them looked like they were just about to form heads. But they never did, and continued to get leggier and leggier. And last week they flowered. 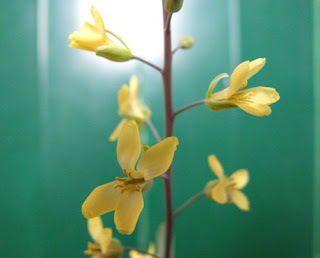 The flowers are about 1/2 inch tall, a pale, sunny yellow without much scent, and have between three and eight petals, although four seems to be the norm. Looking stuff up on the internet now, I'm surprised that I'm not seeing any ornamental brassicaes grown for their flowers (instead of foliage; the "flowering" part "flowering kale" actually refers to the colored leaves), because they're really rather pretty. They are pretty! 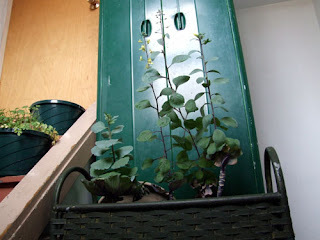 Brussels sprouts are the only brassicas that I've attempted to grow. They never got enough light and never formed heads either. I tore them out, but now I kind of wish that I had left them just to see them flower. I've grown broccoli before and had it go to flower, and it also has little yellow flowers... which would make sense, since it's actually the same species plant as cabbage (and cauliflower, brussel sprouts, kale and collards).